The CSU Chico Atmospheric Lidar Research Group, Hextek Corp., Hofstadter Analytical Services, and the National Center for Atmospheric Research (NCAR), worked together on the development of new 17- by 24-inch octagonal mirrors for the REAL beam-steering unit. Hextek Corp., located in Tucson AZ, specializes in the fabrication of light-weight mirrors through a Gas-Fusion™ process. The new mirrors required the design and fabrication of a new mounting system to assure that stresses imparted by differential thermal expansion of the materials involved do not deform the mirrors 3-waves flatness requirement. Reflective coatings will be applied to the mirrors by L & L Optical Services in Los Angeles. The team presented their work at the 2011 Frontiers in Optics (FiO)/Laser Science (LS) Conference of the Optical Society of America between 16 - 20 October 2011 in San Jose, CA. A PDF of their conference paper can found here. A JPEG of their conference poster can found here. January 2013: Enhanced gold-coated Gas-Fusion™ mirrors made by Hextek Corp.
August 2012: Gas-Fusion™ mirror substrates made by Hextek Corp. Stainless steel and Kovar mounting hardware designed and fabricated to accomodate new mirrors for the REAL beam steering unit. 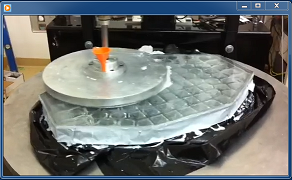 Movie of one of the new mirror substrates being polished at Hextek.